This heavy duty industrial grade strapping cart can handle steel, poly (polypropylene) and polyester strapping. Features automatic brake to reduce strap spillage. Built-in tray for storing tools and seals. Handles steel and non-metallic strapping. Accepts 3", 6" and 8" face coils; 8" and 16" core sizes. 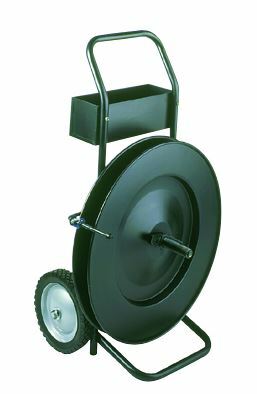 Big 10" x 1.75" steel semi-pneumatic wheel for easy maneuvering. Unit weight - 54 lbs.